There have been many exciting advances in ophthalmology and eye health over the last 50 years. The subspecialty field of retina, which focuses on the back of the eye, is no exception. In the last 15 years, numerous new treatments have changed the way we treat blinding diseases. 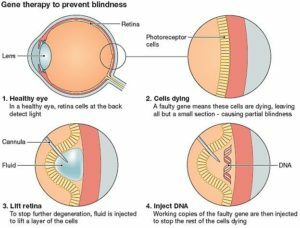 This post focuses on how genetic testing has changed the way we diagnose and treat a genetic disease known as retinitis pigmentosa (RP). As of December 2017, RP has become the first human disease for which gene therapy treatment has gained FDA approval. Patients with RP experience difficulty with night vision, loss of their peripheral vision and eventual loss of their central vision as well. RP is a genetic disease, and often appears in families and is passed down through generations. Since the discovery of RP in the 19th century, doctors have tried many treatments. Most of these treatments had no scientific basis or proven efficacy. Until recently, the only treatment widely accepted by the retina community has been high dose vitamin A supplementation, which has only a very modest effect on disease progression. How did the most recent gene therapy advances come about? As our understanding of molecular genetics has progressed over the last century, over 100 unique genes have been identified as causing RP. The human genome project launched in 1990 has provided scientists with the tools to treat genetic diseases. For patients with RP, this became a reality in December 2017 with the FDA approval of a gene therapy – the first approved for any human disease in the United States. Clinical trials of the drug showed that patients were actually able to gain visual function after the treatment. 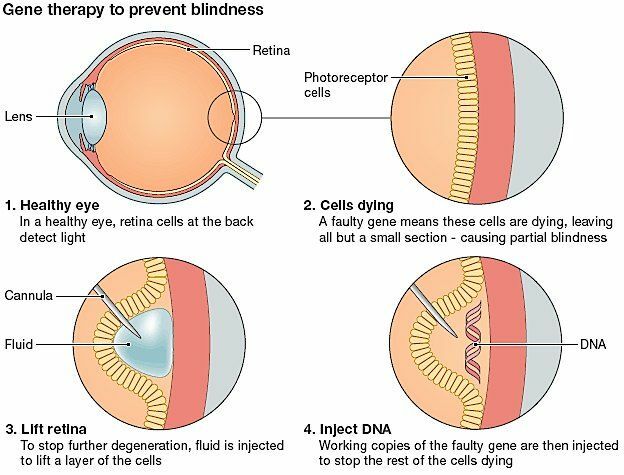 Unfortunately, the genetic mutation addressed by this specific therapy is actually one of the less common defects in RP patients; however, this critical early proof of concept will hopefully open the door for many other treats for RP and other inherited retinal diseases. The retina specialists at the Eye Care Center of Northern Colorado pride ourselves in offering patients the latest and most up to date treatments for all retinal disorders. We are happy to provide consultations to new patients and second opinions to ensure that all people with retinal disorders receive the best possible care. Please call our office at 303-772-3300 to make an appointment today.